Renowned Spanish architect Santiago Calatrava designed this monumental high speed train station in the historic city of Liège, Belgium. Made from glass and steel, Liège-Guillemins TGV railway station gets plenty of natural light - and its fluid, organic design celebrates movement, openness and transparency. We recently had a chance to check out this amazing building firsthand - hit the jump for our exclusive photos! Santiago Calatrava‘s grandiose Liège train station contrasts with the city’s medieval architecture and small scale. 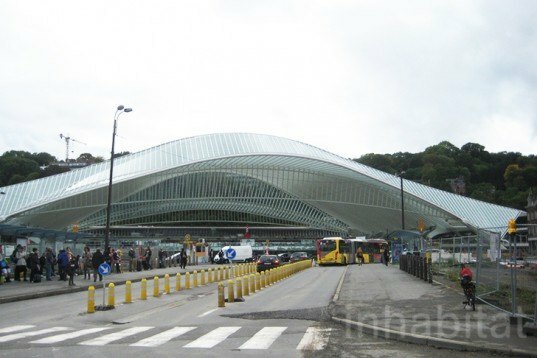 The Liège-Guillemins Train Station is a modern icon that provides locals and visitors with access to high-speed trains that travel throughout Europe. Made from glass, steel and pre-cast concrete, this monumental work of architecture has no façade in the traditional sense – instead it blurs the boundaries between interior and exterior. It is sheltered by a huge vaulted canopy that rises 475 feet above its 5 platforms. This glazed, transparent umbrella lets plenty of natural light in throughout the day, and it’s slightly tinted to provide protection from the sun’s harshest rays. The open station provides amazing views of the city and nearby bridge — also designed in Calatrava’s distinctive style. The station is fluid divider between the city and a nearby leafy hill, and its elegant design matches the high-speed trains it serves. Calatrava began construction on the station back in 1996, and it has grown to symbolize the city’s renewal. Organized vertically, the building has plenty of parking levels and vehicular access for passenger pickup. The commercial retail space and ticketing offices located at the street level right underneath the tracks were also constructed from pre-cast concrete, following the building organic lines. Traveling through the Liège-Guillemins Train Station is a divine experience and finding the platforms is easy – just follow the bright light up the stairs. 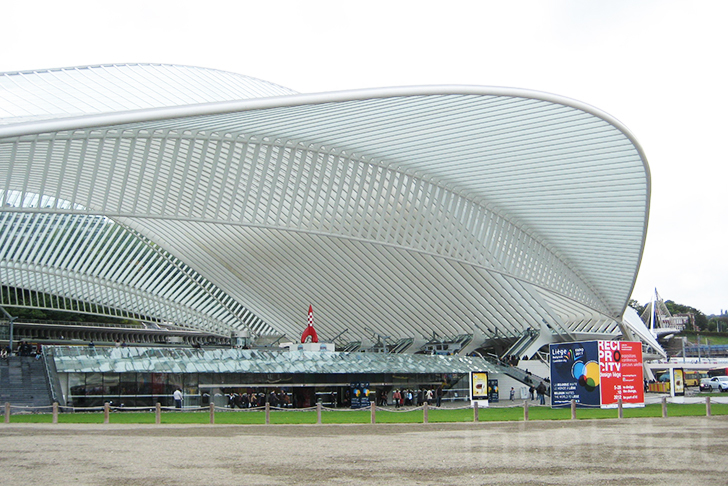 Santiago Calatrava's grandiose Liège train station contrasts with the city’s medieval architecture and small scale. The Liège-Guillemins Train Station is a modern icon that provides locals and visitors with access to high-speed trains that travel throughout Europe. Made from glass, steel and pre-cast concrete, this monumental work of architecture has no façade in the traditional sense - instead it blurs the boundaries between interior and exterior. It is sheltered by a huge vaulted canopy that rises 475 feet above its 5 platforms. his glazed, transparent umbrella lets plenty of natural light in throughout the day, and it's slightly tinted to provide protection from the sun's harshest rays. The open station provides amazing views of the city and nearby bridge -- also designed in Calatrava’s distinctive style. The station is fluid divider between the city and a nearby leafy hill, and its elegant design matches the high-speed trains it serves. Calatrava began construction on the station back in 1996, and it has grown to symbolize the city’s renewal. Organized vertically, the building has plenty of parking levels and vehicular access for passenger pickup. The commercial retail space and ticketing offices located at the street level right underneath the tracks were also constructed from pre-cast concrete, following the building organic lines. Traveling through the Liège-Guillemins Train Station is a divine experience and finding the platforms is easy - just follow the bright light up the stairs. 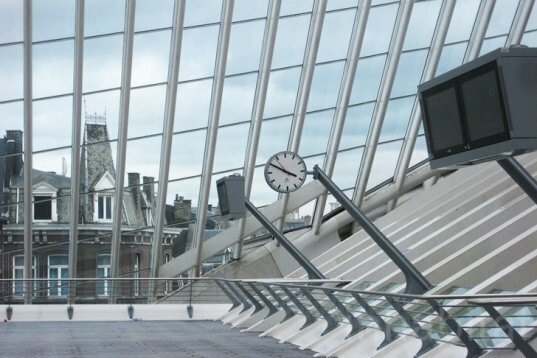 Santiago Calatrava's grandiose Liège train station contrasts with the city’s medieval architecture and small scale. The Liège-Guillemins Train Station is a modern icon that provides locals and visitors with access to high-speed trains that travel throughout Europe.